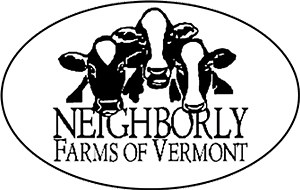 Neighborly Farms of Vermont is located in Randolph Center, VT. This family farm has been owned and operated as a dairy farm for more than 30 years by Rob and Linda Dimmick with their three children Bobby, Bailey and Billy. The farm sits on 168 acres of land and contains cropland and grazing fields for the 48 Holsteins that produce the milk used to make Neighborly Farm cheese. All of our cheese is supplied by Neighborly! Allergen and Facilities Information: All of Neigborly Farms' cheeses are gluten free, though they are not a certified Gluten Free facility.